Sunny and Ari have travelled all over the world together. The last that I knew, it was almost 20 vacations together. I'm sure that they have travelled more since their wedding day. They first met in college. They said their "I do's" on June 10th, 2017 at her Aunt's house in Sandusky, Ohio. Their nuptials brought in family from all over the world, namely Sunny's family from India. The ceremony took place in her Aunt and Uncle's backyard, in front of a gorgeous tree. After the ceremony, the couple took their family formals and bridal party photos, as well as their portraits. The reception also occurred in her aunt and uncle's backyard in a tent, which is where the dancing also took place. At the end of the night, Sunny and Ari had a special event for their guests: fireworks. And trust me, they were gorgeous. What we loved about this wedding, aside from the bride and groom being fantastic, but their wedding was traditional, yet very non-traditional. Ari wore a pink wedding dress! Pink! It was so unique and gorgeous! 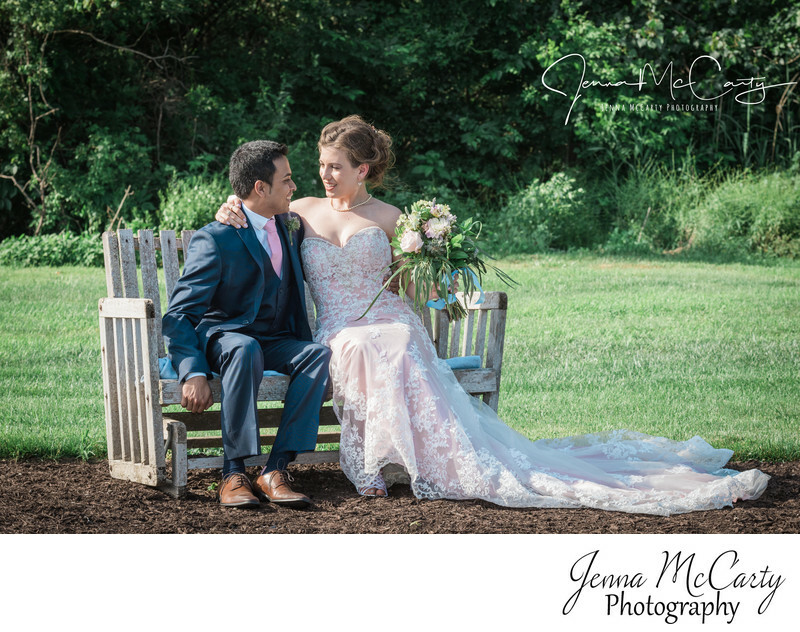 This photo features the bride and groom on a bench in her aunt and uncle's backyard in between the ceremony and the reception.